Bongzilla has been the source of much excitement here at Gadget HQ this week. Not only is one of our most popular products back in stock, but our next office party is now set to be even wilder than the last one! Deal of the Week: Quench Your Thirst! As you may have noticed, we're having a bit of a beer bong blitz here on Gadget Inspector right now. Spring is in the air and we're relishing the imminent arrival of Drinking Season - those golden few months when the weather is fine and the drinks taste great! To celebrate our burgeoning alcoholism the arrival of this season's beer bong haul, we're running a great deal this week on some of our best bong products. 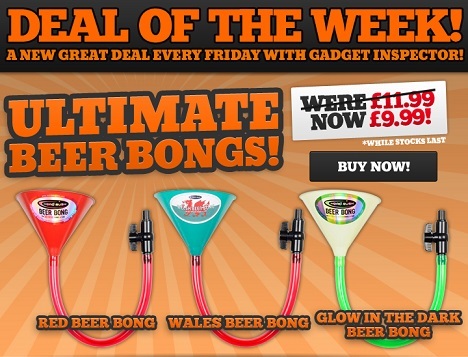 Three of our favourite beer bongs have been reduced to just £9.99 - there's never been a better time to grab a funnel and get chugging! We got a huge shipment of new stock in yesterday, mostly consisting of beer bongs, drinking accessories, and party stuff. We were thrilled, as we always are when this sort of thing turns up on our doorstep, but the one thing that has us really excited is the arrival of a certain six-man beer bong. That's right, folks, Bongzilla is back! This leviathan among beer bongs - the glimmering jewel in the crown of our Party/Drinking section - is a bit of a favourite here at the GI office, and not just because it was one of our best-selling items last time around. You probably won't be surprised to learn that us gadgeteers enjoy the occasional drink every now and then, but Bongzilla is the one drinking product that puts us to shame - the 6 Man Beer Bong Challenge is a surprisingly tough one to conquer! 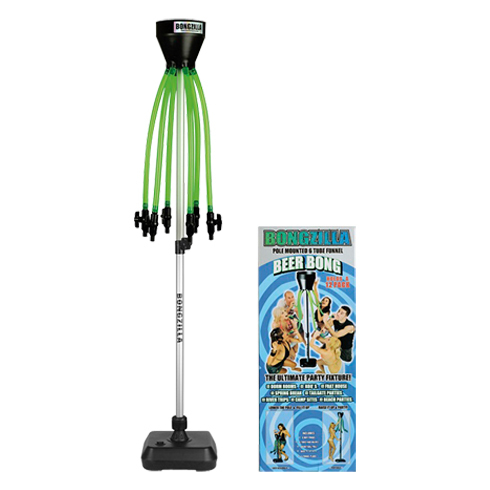 Fill Bongzilla's funnel up with your favourite lager, grab a tube each, and get chugging! If the six of you manage to deplete Bongzilla's beer reservoir without gagging or falling over, then congratulations - you are made of stronger stuff than we are! Beer Bong Season is Here! Tomorrow is the first day of spring, which means that we'll soon be swapping our gloves and scarves for sunglasses and boardshorts. Summer is on its way, everybody! And, with the evenings getting lighter every day, it's the perfect time to get your hands on a beer bong and celebrate the turning of the seasons with a drink or three. No matter where you are - at a house party, out on the town, or just hanging out in the garden with a few of your buddies - a beer bong is always a great way to kick the party off. And you'll be amazed by the sheer variety of beer bongs available. We've got red bongs, green bongs, dual bongs, long bongs, and - back in stock this week - the mighty Bongzilla, a 6-man beer behemoth that will push you and your drinking abilities to the very limit! If you're looking for beer bongs, Gadget Inspector has got you covered this summer. You can even build your own!